1° The beach: Chilling out, Farniente, sunbathing, swimming are the watchwords. Everything is done to engage in them without restriction, while enjoying the luxury that is a private beach exclusively reserved only for the guests of the motu. 2° Walks from motu to motu : They allow long walks alternating walking on the beaches and swimming. 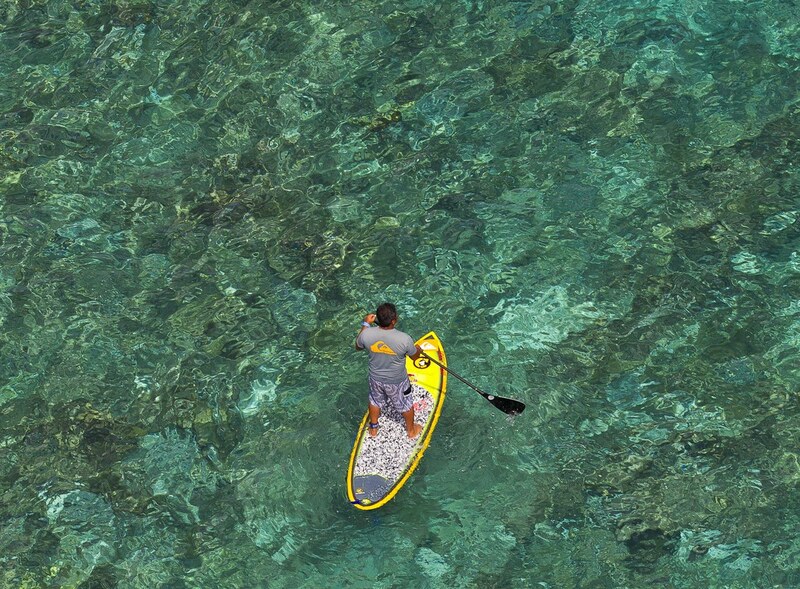 3° Sea sports : Stand-up paddle board and kayaks are available for guests. 4° Walks on the reef : They are an opportunity to discover the wonders of the coral world, the beauty of the ocean, swimming in natural pools, and the collection of "mao’a", a shellfish to eat as soon as collected or to cook at home. 5° Snorkelling : Exploring the "hoa" (channels) in flippers, mask and snorkel offers wonderful observation of fish and coral lagoon areas. 6° Exploring the motu (islets) : walking inside the motus allow exploring the local vegetation. 7° Fishing : The area around the motu is a real nature reserve we strive to protect. It is forbidden to fish or to collect live shells. But fishing enthusiasts can enjoy this activity whether on the ocean side on the reef, or on the shoals inside the lagoon. The boat at their disposal may bring them on emerged coral heads, or lead them according to their wishes on different parts of the lagoon depending on the type of fishing and the weather. Whether hand angling, pole and line, speargun fishing or even patia (spearfishing) or other traditional fishing techniques from the Tuamotu, all aspects of lagoon fishing are available, often in the company of a local fisherman. The copra harvest, the weaving, the use of coconut (coconut milk, sprouted coconuts, coconut water, taioro), food preparation, the making of Monoi are all typical activities that can provide rich learning opportunities about the Polynesian way of life and its resources. You’ll find a selection of books about Polynesia and the Tuamotu Islands, with some novel type books for moments of relaxation outside the planned activities. Audio equipment will be available to listen to the music of your choice.